My favorite cookie recipe to date. 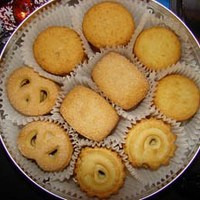 Every year for Christmas my mother would pick up one of those blue tins of butter cookies in those blue tins for the family to snack on while we opened presents on the night before Christmas. I chased this recipe for the better part of a month to find the perfect blend to emulate those sweet, rich little butter cookies the way I remember them as a kid. CAP Sugar Cookie: The perfect base for this recipe. At 5% it's prominent in the mix, but still allows the butter tones to do their work. CAP Golden Butter+Butter Cream: These two in conjunction hide behind the grain in CAP Sugar Cookie just enough to stay away from becoming a frosting note, while still remaining creamy enough to counterbalance the somewhat dry CAP Sugar Cookie flavor. CAP Sweet Cream: The secret weapon. At just 1% it's not enough to taste in the mix, but it helps keep the butter cream from turning to straight frosting in the mix and tame the wild Golden Butter from being too present. TFA Sweetener: I almost never use sucralose, but this was crucial to getting the granulated sugar topping feel.At 1% it's just enough to push that granulated sugar taste without becoming sickly sweet. I mixed this a long time ago and totally forgot to review it. This was by far my favorite cookie recipe for a long time, and it's still up there among the best. That little bit of butter and butter cream brings back some memories.